All the information you need for booking the retreat and travel details........ Thank you for your interest in our Nourish Retreats. We are really passionate about what we are offer on retreats, and believe that a full immersion in nature, supported by yoga, nutritious healthy food and good company will leave you feeling relived and restored. Contact me directly to book the retreat. Fly into either Lisbon or Porto and connect with a national bus to our nearest station, Figueiro dos Vinhos. Both Lisbon and Porto are beautiful cities and guests often extend their holiday by a day or two to spend some time in the city. Please note that it does take a day to get here, including flight time, airport time and catching the bus here. The bus usually takes 3 hours. Please allow at least an hour to either take a bus or taxi from the airport to the national bus terminal. Check in is any time after 5pm on the Sunday of each retreat week. If you plan to fly into Portugal on the same day as the start of the retreat, you will need a morning flight to connect with the afternoon buses. Here is the website for the buses – www.rede-expressos.pt. Tickets can be purchased online or easily at the bus station. The bus leaves Lisbon - Sete Rios Station at 4pm and arrives in Figueiro Dos Vinhos (Just called Figueiro Vinhos on web site) for round 12 EUR. We recommend you buy your bus ticket a couple of weeks before travel. The bus leaves Porto - Rede Expressos Terminal, near Sao Bento at 5pm, and also arrives at Figuiero Vinhas at 7.15pm. Please refer to the bus web site for more information. We will meet and collect guests from the bus station and bring them to Quinta da Flores. Transfers to and from the bus station are included in the retreat package. Please make a note of my phone number in case you need to contact me en-route. +351 961228729. The return bus to Lisbon on Saturday morning either 8.25 am arriving in Lisbon at 11.15am, or a later bus at 9.15am, arriving in Lisbon at 12.45, or 9.15 am (change at Coimbra) buses to both Lisbon and Porto. These early morning buses allow plenty of time to connect with flights at the end of the day. Transfer to and from the bus station is included in the retreat package. Remember to allow yourself time to transfer from the bus station to the airport. 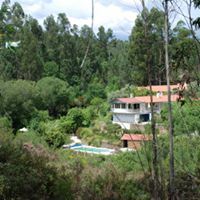 Nourish in Nature September 1 - 7 will be held at Quinta da Flores. Features include - a salt water swimming pool, eco accommodation, en-suite rooms, vegetable and herb garden, indoor and outdoor yoga spaces, natural swimming in the throughout the land and nutritious, tasty food prepared and cooked by Gabi, myself and volunteers. Please let us know when making your booking which option you are interested in. If this is not possible you can pay using paypal, if you send the deposit as a gift I am not charged the 12 % fees. Please send us an email when you make your deposit payment, we will confirm receiving it. Could you also send us your full name for our tax records here in Portugal. Could you also include a brief description of your yoga experience, any injuries past or present, and any special dietary requirements. We ask that the remaining balance be paid before you arrive. If for any reason you are unable to attend the retreat please contact us and we will look at refunding your deposit. Please note – there are no ATM machines locally, you will need to bring cash with you, for payment of buses, massage or kayaking outings. 8.30am – 10am – Morning Yoga Class, warming and dynamic methods, Vinyasa and Hatha Yoga with pranayama and relaxation. 10 am – 11.30am – Brunch, seasonal fruits, cereals, home made gluten free breads and jam, toast, omelette or eggs, grain porridges and a selection of teas (green, black, herbal teas) and coffee. 3 pm - an afternoon snack will be available, energy balls, a healthy cake, or smoothies. 4pm – 6pm – Afternoon free time or treatment time if you decide to book a massage. Please note, we will send you an arrival email a week prior to the retreat which will give the treatment options available. Guest Information – We are really passionate about our guests getting the most out of their retreat experience. It is very important that you tell us everything relevant to your health. We will send you a Nourish in Nature healthcare pack a couple of weeks before the retreat. Included in this pack is a healthcare questionnaire. Please make sure you take a little time to fill them out and return it to us. Thank you. Smokers – If you are a smoker please be aware of other guests. There is no smoking inside and we ask that you don't smoke in the communal areas. Ashtrays are provided, please do not leave cigarette butts lying around on the land. Communal Kitchen- Please help to keep the kitchen and dining area clear of tea and coffee cups throughout the day. Thank you. Food – We provide two tasty wholefood meals a day, plus an afternoons snack or smoothie. Vegan and gluten free options are available. Please tell us if you have any further dietary requirements. Sunscreen, a hat and a towel for swimming. Please bring biodegradable shower products. We ask guests to respect resources and to not bring polluting products. Warm clothing, we are high up and it does cool down at night. We really recommend you bring some warm clothes for evenings and morning yoga practice and relaxation time. Covering up in the evening will also deter the insects if you are outside. Insect repellent, we are close to the reservoir and there are mosquitos around at night, all the beds have mosquito nets, but we recommend you bring some insect repellent with you. We have mats, blocks, straps and eye pillows here, but if if you prefer to use your own yoga mat, please bring it with you. Please note - There are no shops nearby, anything you may need for example from a chemist, please bring it with you. Wifi – We do have wifi which guests are able to use, we do encourage guests to take a break from technology and have a little digital detox time, as much as is possible.